Hi everybody, my name is Derek and I sold the 1.01. 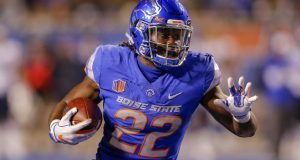 I know what you’re thinking, “he’s crazy – doesn’t he know that Saquon has already been put into the pro football hall of fame, is going to rush for 1800 yards and 30 touchdowns in his first year and cure cancer?” Don’t get me wrong, I love Barkley as a prospect too but the hype train has gone off the rails and his value has skyrocketed. Let’s take a closer look at just why I recommend shopping the 1.01 around your league. Let’s start the discussion with Saquon himself. Yes, the tape was impressive. Yes, the combine numbers were impressive. AND yes, he has a good shot to be a superstar running back in the league. With that being said, I urge you to listen to the little voice in the back of your head. The one that is whispering that there is a chance, even a small one, that Barkley could just be *gasp* pretty good or *gasp* ordinary or *gasp* even a bust. Does that voice sound like Trent Richardson to anybody else? No? Just me? In a vacuum, I prefer any one of those players one for one to Barkley but the best part is that in most cases you can get one of those players AND extra value on top for the 1.01 rookie pick. Let’s break down my own trade as an example. In this particular league, I am in a rebuild with needs at both wide receiver and quarterback. By making, what I consider to be, a lateral move from Barkley to Michael Thomas I was able to simultaneously divest myself of declining veteran assets and shore up my weaknesses at quarterback and wide receiver. 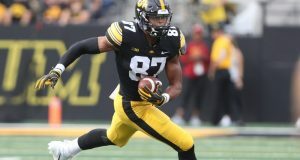 The moral of the story is that dynasty twitter, podcasts and websites have whipped people up into a frenzy over the 1.01 rookie pick. They are so excited to own a share of Barkley that they are willing to overpay and mortgage the future of their team. Maybe he is the next Gurley, Bell, Zeke or DJ but if that’s the case why not try to trade him for one of those guys and a lot more? 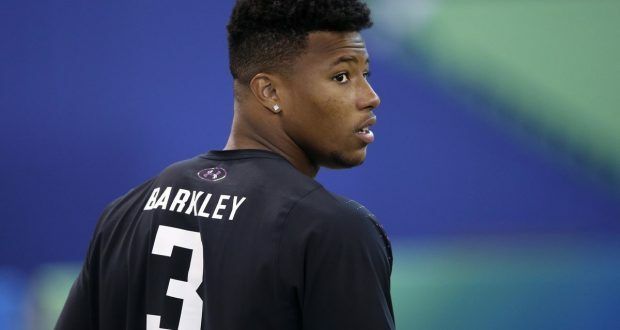 If you can swing a deal like that do it now before the draft, I have a feeling that once reality sets in and Barkley has a landing spot his value might drop a bit. If you cannot get a king’s ransom then just hold onto the pick and take him – in either case, good luck in 2018! I have been a life long football fan and a Dynasty enthusiast for the past several years. When not living and breathing all things fantasy football I enjoy spending time in south east Wisconsin with my wife, son and two dogs. I wish I played in a league of tacos too. Honestly I felt the same as you, I did not expect to find that deal. If you have the 1.01 explore those options though. Propose deals you would consider to be outrageous returns. The worst that happens is you get shot down and end up with Brakley.